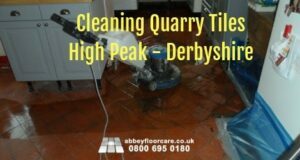 When our client searched for professional quarry tile cleaning Birmingham, she discovered that when it comes to cleaning quarry tiles, you can’t beat the results achieved by a professional quarry tile cleaning company like Abbey Floor Care (Me). This red clay quarry tile floor is around 90 years old, located in the historic area of Bournville in Birmingham. There were only a few cracked tiles and a small area where cement had been used to fill a lost tile edge. But other than that, the floor was in very good condition considering its age. the gloss surface sealer was scratched and worn in a number of areas, particularly by the entrance door and along one wall. The problem along the wall was probably caused by the sealer not adhering to the floor as opposed to wearing through abrasion. three were a few areas where cement has been used to repair the where old carpet gripper had been removed. We started by installing protective plastic sheeting to the walls and adjoining rooms to protect them from splashes and spills from the work area. Cleaning quarry tiles generally starts by removing the old sealers. And here we applied a layer of broad-spectrum sealer and coating remover and left it for a couple of hours to do its work. We used rotating brushes and hand pads to carefully remove the coating. The floor was then rinsed to remove all traces of sealer remover and leave in a neutral condition. Throughout we were careful not to over wet the floor because we did not want water to migrate into the subfloor. Once the stone oil had cured we applied a couple of coats of impregnating sealer to improve the protection. Now the floor was protected filled the missing grout with dark grey grout. The result is a that looks as if it has been carefully cared for so retaining a beautiful finish. The client was absolutely delighted with the clean and the finish. 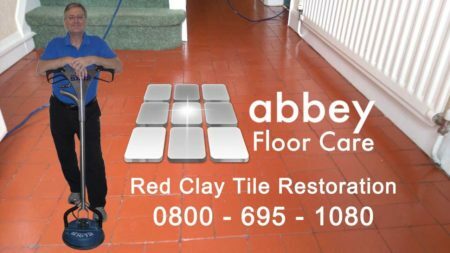 If you need help with cleaning quarry tiles or any other kind of stone floor restoration to a beautiful finish call Abbey on 0800 695 0180 or complete this simple contact form. 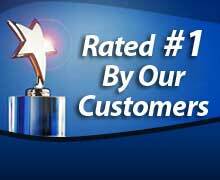 Here is a video about quarry tile cleaning Birmingham we made that is on youtube. We carefully explained the importance of looking after the floor properly, using the right cleaners and pop systems. So their floor will continue to look beautiful for years to come. If you want to try cleaning your quarry tiles yourself, we have a useful guide on how to clean quarry tiles. If you prefer to leave the cleaning to experts, check out other examples of our quarry tile restoration services.